The vibrant colors of fall are spreading throughout the Adirondacks, and many communities are celebrating the season with all kinds of events and activities. 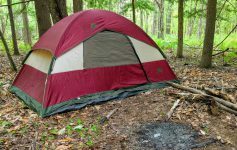 We’ve rounded up some of the best that will be going on this weekend in the Adirondack Park! You may have been to your local neighborhood garage sale, but have you ever been to the World’s Largest Garage Sale? This weekend, over 500 vendors will be selling new and old items, antiques, collectibles, toys, and more throughout Warrensburg. Shop for hidden treasures, purchase some delicious street food, and enjoy the weekend. Look forward to games, arts and crafts, music, vintage cars, and more at the annual Life Flight PumpkinFest at the Adirondack Regional Airport. Admission to this family-friendly festival will be just $1pp. Join the Lake Placid Pub & Brewery for some Oktoberfest fun beginning at 11:00am on Saturday. There will be plenty of music, food, games, and beer, as well as an Oktoberfest 5K! 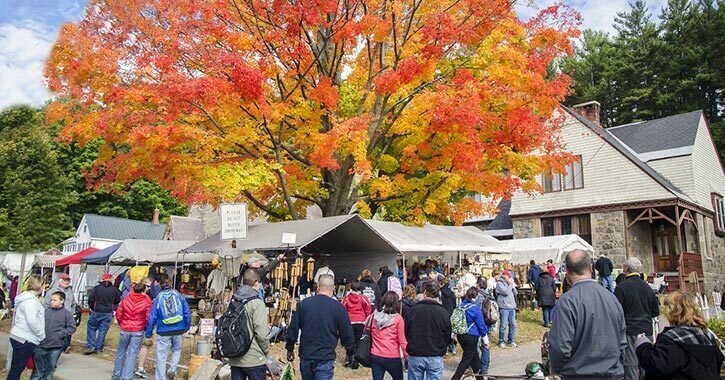 A variety of autumn-themed events and activities will take place during the inaugural Ticonderoga FallFest on Saturday. Highlights will include the Country Florist & Gifts FallFest, a family movie night, food and drink specials, sales, and much more. Most of the events will be free to attend. Bask in the beauty of fall at Oak Mountain Ski Center’s annual Oaktoberfest! This free festival will feature a craft fair, strolling magic show, pony rides, live music, scenic chairlift rides ($5pp), and more. Reservations are required to attend the buffet dinner. The 2nd Annual Adirondack Rock Climbing Rendezvous will be held this weekend and offer climbers a chance to tour and experience the beautiful Lake Placid area. The three-day event will include clinics, presentations, concerts, and more fun for the vertically inclined. Plan a trip to Gore Mountain in North Creek on Saturday and see the spectacular fall foliage at the summit. Visitors who purchase a gondola ticket or have a 18-19 season pass can participate in the group hike to the Gore Fire Tower. Hikers are asked to be there by 11:00am. Want to see the Grand Canyon of the Adirondacks? Register for the annual Chasm 5K Trail Run at Ausable Chasm, which will take place this Saturday at 8:00am. Proceeds from the race will benefit the North Star Underground Railroad Museum. Take a trip up to Heaven Hill Farm in Lake Placid and have fun at their family-friendly 5K run/walk. Funds raised will help support STOP Domestic Violence and go towards supplying duffle bags to women leaving domestically abusive situations at home. Enjoy a fully supported recreational bicycle tour of the Adirondacks during the 3rd Annual Bike the Barns. Hosted at Asgaard Farm & Dairy in Au Sable Forks, this one-day farm-by-bike experience will bring riders to various farm tour stops around the region. It’s a great way to get outdoors this Sunday and connect with the local food revolution!